Community Palliative Care examines the complex support and information needs of seriously ill patients and their families and will encompass not only the patient’s journey, but that of the family during the illness trajectory and into the bereavement period. The text is divided into three sections- professionals, patients and carers. The first section discusses the roles and contributions made by other members of the primary health care team and examines the role of the nurse. Section two explores the psychosocial support needed by patients receiving palliative care, and looks at the community palliative care clinical nurse specialists’ role in relation to psychological, as well as practical problems surrounding a life threatening illness. The final section will look at the needs of the family and carers and the support that the community palliative care clinical nurse specialist can offer to the individuals. Included in this segment will be the complex issues faced by carers in relation to the changing roles within the family, children, death and bereavement. Chapter 1. Community Palliative Care: the team. Chapter 2. 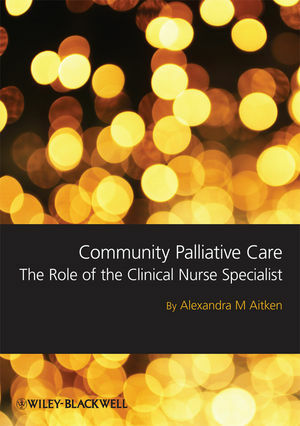 The Role of the Community Palliative Care Clinical Nurse Specialist. Chapter 3. Living with a Life Threatening Illness. Chapter 4. Life at Home. Chapter 5. Dying at Home. Chapter 6. What do Carers do?. Chapter 7. Hearing the Pain of the Carer. Chapter 8. Death and Bereavement.